As the B20 Summit in Tokyo is approaching, it was about time to gather for an exchange on this year’s Japanese G20 process! 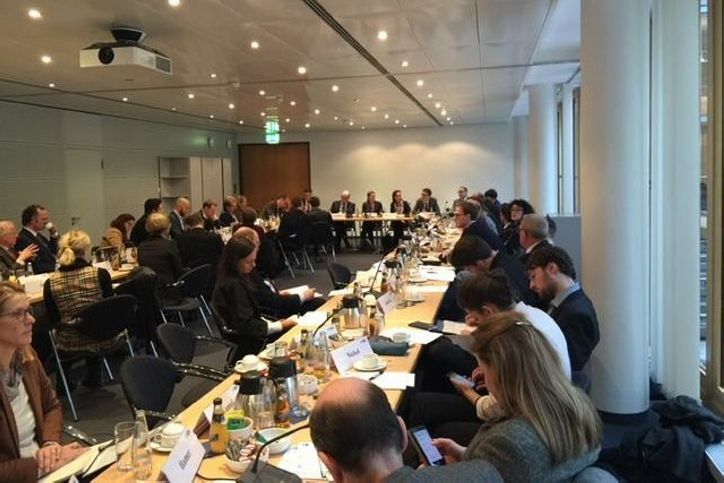 On 9 January, several representatives of German companies came together for the workshop “Towards the Tokyo Summit” to discuss the status quo of the G20 process with government representatives. Dr. Lucinda Trigo Gamarra, head of the G7/G20 Sherpa Staff at the Federal Chancellery, opened the workshop with a review of the Argentinian G20 Communiqué, before outlining the focus topics of the Japanese G20 Presidency. Other ministry officials informed about the individual G20 work streams. Stefan Schnorr, head of the department “Digital and Innovation Politics” at the Federal Ministry for Economic Affairs and Energy, offered insights into the G20 work stream “Digital Economy”. Dr. Christian Forwick, head of the sub-division for “Foreign Trade, Trade Politics and America” at the Federal Ministry for Economic Affairs and Energy, informed the audience about the developments in the work stream “Trade and Investment”. Other panels focused on the G20 work streams “Climate Sustainability” and “Energy Transitions”, “Finance”, “Health” and “Employment”. The various reports by government representatives offered a comprehensive view on G20 Argentina and the upcoming Japanese G20 cycle. The workshop participants agreed that the Argentinian G20 Leaders’ Declaration did not reach the same level of ambition as previous declarations. Given the difficult geopolitical environment, they nonetheless considered the outcome a success. Even though the atmosphere during the upcoming negotiations is expected to be more constructive than during the Argentinian G20 Presidency, consensus-finding will remain difficult, the participants agreed. The Japanese Presidency will focus, among others, on sustainable growth, international trade, quality infrastructure, digitization, global health, aging societies, and ocean pollution. B20 Germany will continue to support the Japanese B20 Presidency to elaborate on innovative and implementable recommendations for the G20. These recommendations will be handed over to the G20 during the B20 Summit on 14 and 15 March in Tokyo. We thank the numerous business and government workshop participants for a stimulating and interesting exchange!